Anglo-American Cataloguing Rules (AACR) is the essential international cataloguing code used for descriptive cataloging of various types of information resources by libraries in the United States, Great Britain, Canada, and Australia as well as in many other countries. It was first developed in 1967 and updated regularly until 2005. The revisions and updates of the standard are referred to as AACR2. 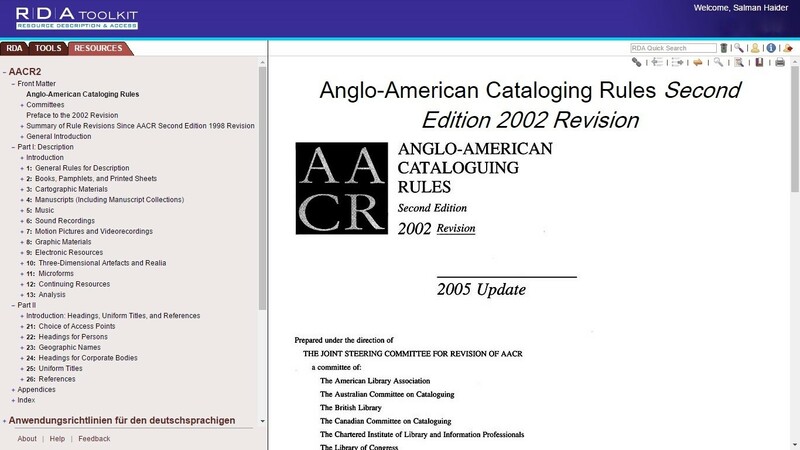 The second edition of Anglo-American Cataloguing Rules (AACR2) is the most widely used cataloging code, designed for use in the construction of catalogs and other lists in general libraries of all sizes. AACR2 comprise a detailed set of rules and guidelines for producing metadata in a surrogate record to represent a library resource. The rules cover the standard description of areas like, the title, publisher, edition, series, etc., as well as the provision of choice and form of access points (headings) for all materials which a library may hold or to which it may have access, including books, serials, cartographic materials, electronic resources, etc. AACR also provides rules for the formulation of standard forms of names and titles to provide access to and grouping of those descriptions. AACR2 standardized cataloging and ensured consistency within the catalog and between the catalogs of libraries using the same code in describing the physical attributes of library materials identically. AACR marked a shift from the previous cataloging rules, which were criticized for being too detailed, complex, and mere compilations of rules to handle specific bibliographic cases. Anglo-American Cataloguing Rules are considered as the most important advances in English-language codes for descriptive cataloging during the twentieth century. There had been efforts for catalog standardization by agencies in the United States, Great Britain, and other developed countries. From the end of the nineteenth century until the mid of twentieth century, the American Library Association, the Library of Congress, the Library Association, and the British Library developed a different set of cataloguing rules individually or in collaboration. 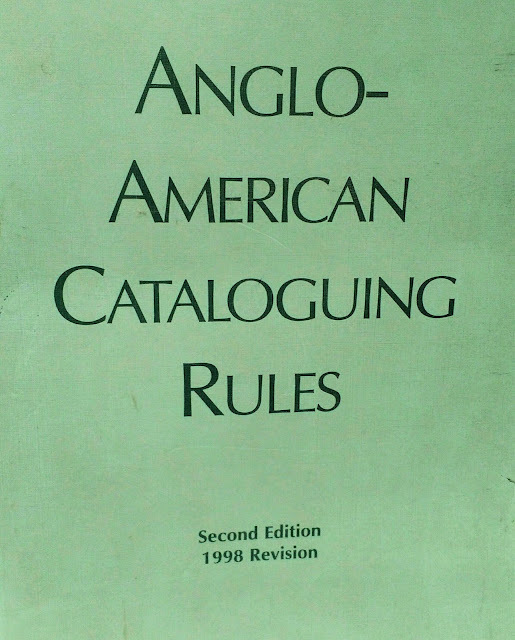 The first significant code resulting from Anglo-American cooperation was Catalog Rules: Author and Title Entries of 1908 (AA 1908), which was prepared jointly by committees of the Library Association and the American Library Association and contained 174 rules for authors, titles, and associated descriptions. However, the two groups did not reach full agreements on all details and the code was published in two editions—British and American. These rules went unrevised for the next twenty years. During the early 1930s, there was a general feeling that the Anglo-American cataloging code needed a revision but the cooperative efforts for the revision could not be fully realized due to the eruption of World War II when the British government declined further involvement. 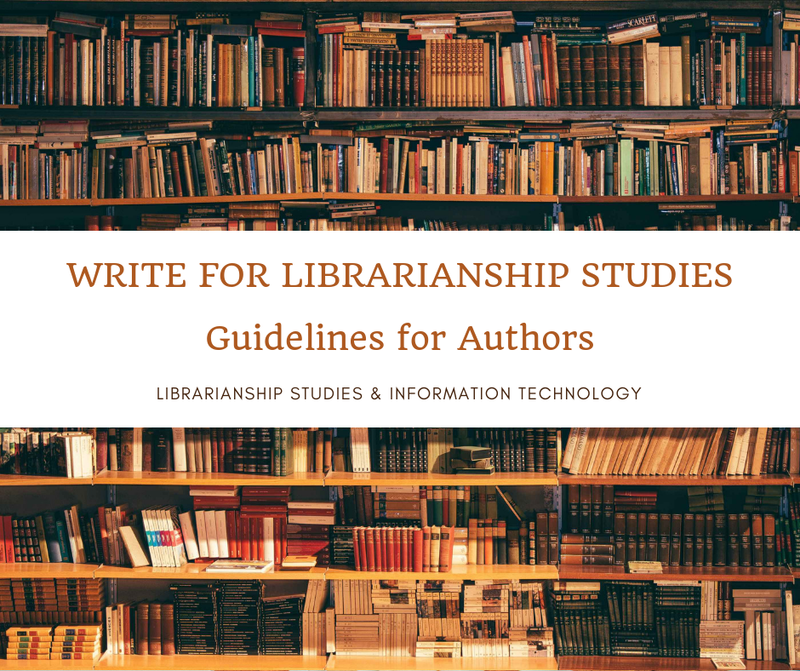 In 1949 the American Library Association published ALA Cataloging Rules for Author and Title Entries (ALA 1949) which was a revision of its preliminary work produced in 1941. This edition contained only rules for entry and heading. As the ALA 1949 code did not contain rules for descriptive cataloguing, the Library of Congress took responsibility for documenting rules of this nature. As Library of Congress catalogue cards was widely used by American libraries, there was interest in the rules used by the Library of Congress. 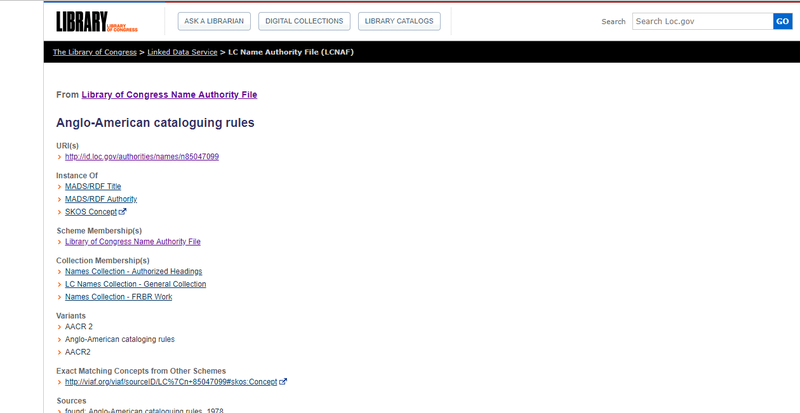 As a result Rules for Descriptive Cataloging in the Library of Congress was published in 1949 (LC 1949), and the rules were adopted by the American Library Association. LC 1949 included rules for separately published monographs, serials, and some non-book materials. 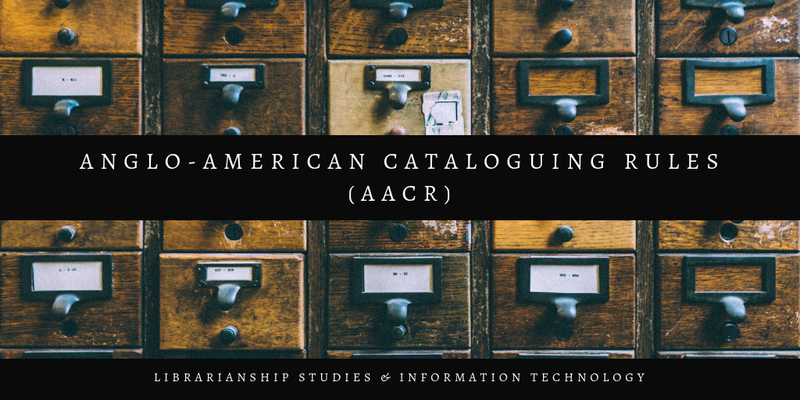 Together, ALA (1949) and LC (1949) served as the standards for descriptive cataloging for American libraries until the appearance of the AACR in 1967. The American Library Association invited Seymour Lubetzky of the Library of Congress in 1951 to prepare a critical study of the ALA 1949 code. As a result, Lubetzky prepared a critical analysis in his report Cataloging Rules and Principles (1953) which advocated a move towards a less complex code based on well-defined principles rather than a case-based code providing duplicate and overlapping rules for identical conditions. Another Catalog Code Revision Committee was established by ALA for the purpose of drafting a new code. In 1956 Lubetzky was appointed the editor of the revised code, and in 1960 he produced the Code of Cataloging Rules; Author and Title Entry: An Unfinished Draft. A major event in the history of AACR and cataloging was the International Conference on Cataloguing Principles held in Paris in 1961 to examine the choice and form of headings in author/title catalogues where a draft statement of cataloging principles based on Lubetzky’s Code of Cataloging Rules was used as the basis for consideration. The outcome of this conference was a statement of 12 principles known as the Paris Principles. Anglo-American cooperation proceeded for code revision on the basis of work already done under Lubetzky and the Paris Principles. 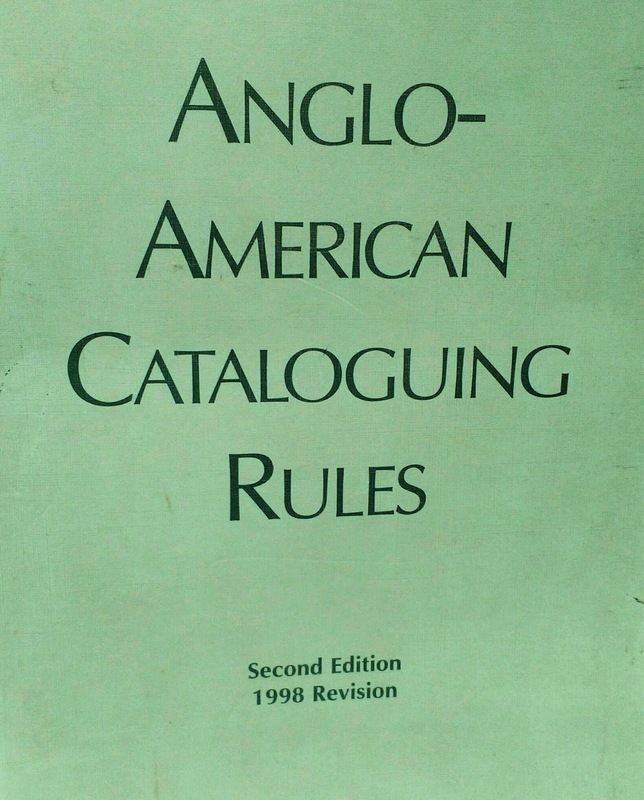 The first Anglo-American Cataloging Rules (AACR) were published in 1967 in two different editions; North American Text for the United States and British Text for the United Kingdom. AACR was the result of work by the American Library Association (ALA), the Library of Congress, the Library Association (UK), and the Canadian Library Association. The American Library Association and Library Association co-operated by exchanging minutes and working papers, and attending each other’s meetings. In addition, the Library of Congress assisted with revision of the descriptive cataloguing rules, and the Canadian Library Association was involved in reviewing drafts of the rules. Both texts of AACR contained three parts. Part I was titled Entry and heading. It contained five chapters, which were based on the Paris Principles, the ALA 1949 rules, and Lubetzky’s 1960 draft. Part II was titled Description. It contained four chapters, consisting of revised rules from the LC 1949 rules. Part III was titled Non-book materials, which contained rules for both entry and description of non-book materials. Each text contained an appendix listing rules for entry and heading that differed in the other version. After Paris Conference and the development of Paris Principles, the next major step toward a greater international agreement was taken at the International Meeting of Cataloguing Experts, held in Copenhagen in 1969. At this meeting, a program of International Standard Bibliographic Description (ISBD) was developed. ISBD is a set of rules produced by the International Federation of Library Associations and Institutions (IFLA) to create a bibliographic description in a standard, human-readable form to describe a wide range of library materials. It concerns only with the descriptive aspect of cataloging, not with entry points or headings. ISBD specifies the sources in the publication from which the various elements of the description were to be transcribed; the order in which these elements should be recorded; and the punctuation marks to be used to separate the individual elements. The effect of the application of the ISBD rules is to produce a standard pattern that is recognizable to catalog users and which enables the easy exchange of records created by different agencies. ISBD later formed the basis for the next version of AACR. By 1973, it was felt that a thorough revision of AACR is required. This led to a meeting in 1974 of representatives of the national libraries and library associations of the United States, the United Kingdom, and Canada to plan for the second edition of Anglo-American Cataloguing Rules. The representatives at this meeting agreed to establish a Joint Steering Committee for the Revision of AACR (JSC). The JSC was established in 1974 and charged to review AACR and develop a single unified set of rules. Members of the JSC were the American Library Association, the British Library, the Canadian Library Association (represented by the Canadian Committee on Cataloguing), the Library Association, and the Library of Congress. The JSC appointed an editor from each side of the Atlantic for the revised code, Michael Gorman being from the British Library, and Paul W. Winkler from the Library of Congress. AACR was revised in 1978 by the JSC which integrated the North American and British texts into a single version known as AACR2 (Anglo-American Cataloguing Rules, Second Edition), adopting the British spelling 'cataloguing.' AACR2 extends to style, which is generally in accordance with the Chicago Manual of Style. British spelling of words was decided to be used if the British spelling appeared as an alternative in Webster’s Third New International Dictionary of English Language, Unabridged. American usages were chosen in some cases (e.g., parenthesis instead of the British brackets) and British usages appeared in other cases (e.g., full stop instead of period). Unlike its predecessor, AACR2 is structured in two parts. Part I (chapters 1-13), titled Description, deals with the provision of information describing the item being catalogued covering the rules for bibliographic description. Part II (chapters 21-26), titled Headings, Uniform Titles, and References, deals with the determination and establishment of headings covering the rules for choice and forms of access points under which the descriptive information is to be presented to catalog users, and with the making of references to those headings. The introductions to parts I and II begin on each part respectively. In both parts, the rules proceed from the general to the specific. Part II is followed by Appendices (A-E), which deal with capitalization, abbreviations, numerals, glossary, and initial articles of titles in different languages respectively. Chapter numbering in AACR2 is not consecutive. Numbers 14 to 20 for chapters are omitted to allow future additions to the standard and also to provide the mnemonic structure of the text. In Part I, the basic rules for the description of all library materials are found in chapter 1, which sets out all the rules that are of general applicability, meant to be applicable to any form, including those not yet in existence. Each of the chapters numbered 2 through 12 provides rules for the description of a specific type of material, viz. books, pamphlets, and printed sheets, cartographic materials, manuscripts, music, sound recordings, motion pictures and video recordings, graphic materials, machine-readable data files (changed in 1988 to computer files), three-dimensional artifacts, microforms, and continuing resources (serials). Chapter 13 contains rules for making analytical entries and has its own structure. In Part II, the first chapter (chapter 21) deals with the rules for choice of access points for main and added entries. Further chapters give rules for creation of headings of personal names, geographic names, and corporate names (chapters 22-24). The next chapter 25 of Part II deals with the creation of a uniform or standard title for a work that may have had many manifestations differing in form and content. The last chapter 26 contains rules for the creation of references from variant and different forms of the name or uniform title. The rules in Part II apply to works and not to physical manifestations of those works, though the characteristics of an individual item are taken into account in some instances. In AACR2, the JSC decided to conform to international agreements and standards, as a result, the ISBDs formed the basis for Part I, and in Part II the rules were brought more closely into line with the Paris Principles. Each chapter (1-12), regardless of the medium with which it is concerned, follows the principles of ISBD. The ISBD (G) was incorporated into chapter 1 as the general format for bibliographic description. Each of the subsequent chapters numbered 2 through 12 is based on a specialized ISBD. For example in chapter 2, the basis of the rules for the description of monographic materials is ISBD (M): International Standard Bibliographic Description for Monographic Publications. Over the years AACR2 has been updated by occasional amendments. The main revisions of the second edition were published in 1988, 1998, and 2002. Instead of calling these revisions of AACR2 as ‘third edition,’ the JSC decided to call them as: Anglo-American Cataloguing Rules, 2nd Edition, 1988 Revision (AACR2R; 1988), Anglo-American Cataloguing Rules, 2nd Edition, 1998 Revision (AACR2R; 1998), and Anglo-American Cataloguing Rules, 2nd Edition, 2002 Revision (AACR2R; 2002). The 2002 revision included substantial changes to sections for non-book materials. Updates of the standard were also published in 2003, 2004, and 2005. AACR2 is published jointly by the American Library Association, the Canadian Library Association, and the Chartered Institute of Library and Information Professionals. 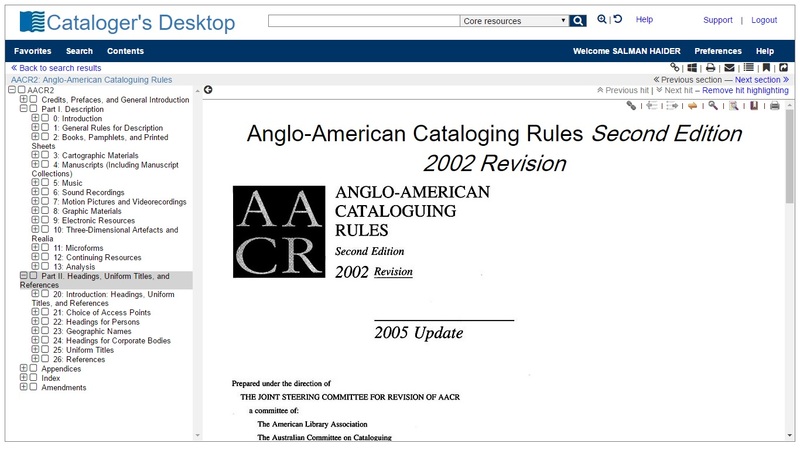 The publication of the Anglo-American Cataloguing Rules is governed by the Committee of Principals (CoP), which coordinates three subordinate groups: The Co-Publishers of AACR, The Joint Steering Committee for Revision of AACR (from October 2007 the Joint Steering Committee for Development of RDA), and The AACR Fund Committee. The Committee of Principals comprises the CEOs/Directors (or designates) of the three national associations (the American Library Association, the Canadian Library Association, and the Chartered Institute of Library and Information Professionals), and the Directors (or designates) of the Library of Congress, Library and Archives Canada, the National Library of Australia, and the British Library. The JSC reviews the need for revisions, prepares the text, and advises the CoP. The AACR Fund Committee receives royalties from sales of AACR2. For the libraries that do not need the details contained in the full edition of AACR2, The Concise AACR2, a simplified concise version was prepared by Michael Gorman, one of the editors of AACR2. It was published in 1981, and revised in 1989, 1999, and 2004. The second edition of Anglo-American Cataloguing Rules has been translated into many other languages throughout the world, including Arabic, Chinese, Latvian, Portuguese, and Spanish. AACR2 is accessible online via Cataloger’s Desktop and RDA Toolkit, but it is required to subscribe to RDA Toolkit to access AACR2 from within Cataloger’s Desktop. Cataloger’s Desktop is a web-based cataloging documentation subscription service by Library of Congress. 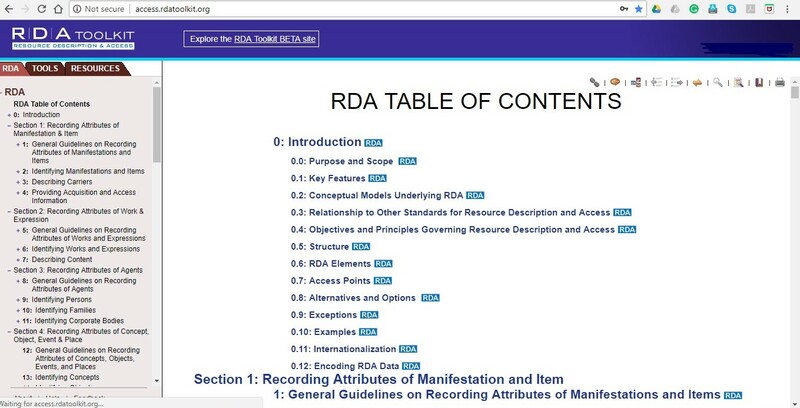 RDA Toolkit is an integrated, browser-based, online product published by American Library Association, Canadian Federation of Library Associations, and Chartered Institute of Library and Information Professionals (CILIP) that allows users to interact with a collection of cataloging-related documents and resources including RDA and AACR2. Title authority records for Anglo-American Cataloguing Rules. The Library of Congress provided its decisions regarding options, modifications, and interpretations of the Anglo-American Cataloging Rules (AACR2) in the form of Library of Congress Rule Interpretations (LCRI). LCRI was started in 1988. It was updated quarterly and cumulated annually till 2005. The application of LCRI ensured consistency in the cataloging of the Library of Congress, as well as other libraries that make the use of cataloging data of the Library of Congress. At present LCRIs are accessible through Cataloger’s Desktop. In the early 2000s, discussion began on a new edition of AACR. In 2004, work on the new edition (AACR3) started and Tom Delsey was appointed as the editor. The JSC decided to revise AACR2 extensively and in December 2004, the draft part I of AACR3 was put out for review. In April 2005, as a result of the reaction to the draft of part I, the JSC decided to scrap AACR3 completely and start fresh in a totally new direction by changing the name of AACR3 to RDA: Resource Description and Access. RDA was decided to be based on the conceptual models Functional Requirements for Bibliographic Records (FRBR) and Functional Requirements for Authority Data (FRAD) developed by IFLA which provides a flexible framework to describe all bibliographic resources. FRBR and FRAD provide special attention to digital resources and allows for better efficiency for organizations that use emerging database technologies. In June 2009, the JSC delivered the full text of the new standard to the publishers of RDA. Finally, AACR2 has been succeeded by Resource Description & Access (RDA), which was released in June 2010 as part of an integrated online product called RDA Toolkit. RDA builds on the strengths of AACR2 with some new features that make it more useful for resource description as a cataloging code for the modern libraries operating in a digital environment. Haider, Salman, Encyclopædia Britannica, "Anglo-American Cataloguing Rules," posted 11/22/2016. https://www.britannica.com/topic/library/Cataloging#toc336275 (accessed December 8, 2018). RDA Toolkit. http://access.rdatoolkit.org/ [subscription required] (accessed September 2016). Cataloger’s Desktop. https://desktop.loc.gov [subscription required] (accessed October 2016). Anglo-American Cataloguing Rules. Prepared by the American Library Association, the Library of Congress, the Library Association and the Canadian Library Association. British text; Library Association: London, 1967. Gorman, M.; Winkler; P.W., Eds. Anglo-American Cataloguing Rules. 2nd Ed. ; Prepared under the direction of the Joint Steering Committee for Revision of AACR; Canadian Library Association: Ottawa; Library Association: London, 1977. This was followed by revisions in 1988, 1998, etc. Cataloging Rules, Author and Title Entries. Compiled by committees of the American Library Association and the Library Association. American Ed. ; American Library Association: Chicago, 1908. The British edition was entitled Cataloguing Rules: Author and Title Entries. Beetle, C., Ed. A.L.A. Cataloging Rules for Author and Title Entries. Prepared by the Division of Cataloging and Classification of the American Library Association, 2nd Ed. ; American Library Association: Chicago, 1949. Rules for Descriptive Cataloging in the Library of Congress / adopted by the American Library Association. – Washington, D.C. : Library of Congress, Descriptive Cataloging Division, 1949. Lubetzky, Seymour. Cataloging Rules and Principles; a Critique of the A.L.A. Rules for Entry and a Proposed Design for their Revision. – Washington : Processing Dept., Library of Congress, 1953. Lubetzky, Seymour. Code of Cataloging Rules; Author and Title Entry. – Chicago : American Library Association, 1960. ISBD(M): International Standard Bibliographic Description for Monographic Publications; IFLA Committee on Cataloguing: London, 1974.